This will be our final post of Yo La Tengo shows this year. With eight nights to cover, plus opening band recordings still to come, you might start wondering why this site didn’t just change its name to “YoLaTengoTaper” at some point. But the fact is, the live experience of rock music is all about surprise, virtuosity and connection, and if any band can do those three things over the course of eight nights in the same venue better than Yo La Tengo, I haven’t seen it. They’ve been various hailed (or mocked, depending on your perspective) as a rock critic’s type of band – earnest record collectors themselves whose vast knowledge of the music they like influences and changes the music they play. Over these eight nights, you get the feeling that you’re getting a look into their no-doubt-massive record collection. You see the band cover every manner of obscure tune to big rock anthem, with artists that have affected their careers and that still inspire them taking the stage as openers. These Hanukkah shows are a distillation of all that makes this band great. And for many of us, this band represents so much of what makes music great. To really appreciate how true that is, I recommend that you read Jesse Jarnow‘s painstakingly researched and endlessly entertaining biography of the band and the era they came up in, Big Day Coming: Yo La Tengo and the Rise of Indie Rock. Then listen to these shows again, and see how much Jesse has opened up the world of this band to you. 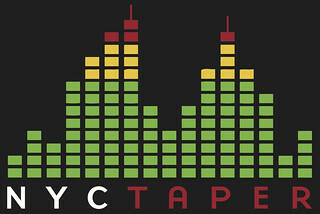 Neither of us from NYCTaper were able to actually attend this show, so we would like to extend our thanks to a fellow taper who has flown to New York from Portland to share the section with us for the last several years for allowing us to post his recording. He goes, appropriately enough, by the moniker “yltfan”, and I think anyone who would fly across the country to see and record the band deserves that title. He has done an amazing job capturing this show, and like the rest of you, I’m going to enjoy giving it a full listen to get the full feel of its greatness (including the band playing with guest vocalist Barbara Manning, and a killer version of “Five Cornered Drone (Crispy Duck)”). yltfan used Audio Technica 4053 hypercardiod microphones and a soundboard feed from Mark, the band’s engineer, and Carson, Maxwells’ longtime engineer. Like the rest of the YLT Hanukkah recordings, this one is is outstanding. Enjoy! This show was a benefit for the Ali Forney Center, which provides housing for homeless LGBT youth, and was severely damaged in Hurricane Sandy. Yo La Tengo asked repeatedly during these shows for fans to consider the low ticket price and to give additional funds to the causes they chose. As we are offering the download for free and without any requirement to donate to the charity, we ask that you please do so. Due to high download volume, we are hosting these files off-site. The off-site host has a maximum download limit of 500, which will periodically be reached. Please let us know if the download limit is reached and we will re-upload the files in a new location. Thank you, thank you, thank you. A heroic effort. Thanx so much for this year’s glorious YLT-recordings. I’ve already bought my ticket for next year’s show at the “ZAKK” in Düsseldorf. Merry Xmas everybody and a very good new year. Thanks for all these great shows. Very cool site…I’m curious though…I approached Ira at a show here recently and asked if I could share my recording of the show and he said “no” and seemed pretty bummed that I’d recorded the show. What’s the “rest of the story” re: YLT’s recording policy, if any? Keep up the good work! I can’t speak for the band, but they have allowed plenty of folks besides us to record their shows. As to why they don’t want any individual one shared, that’s a question for them. Also, we ask permission for what we are doing before we do it, not after the fact. If you had asked him beforehand, you may have gotten a different answer. That’s odd, since so far as I know Ira’s position previously has always been, “Do what you gotta do, just don’t get me involved.” Was this a show where they were debuting unreleased songs, maybe? I’m not sure if they debuted any songs… It was the Santa Cruz show last spring. Ira said that sharing the show on the web was like “bailing the ocean with a tea cup”… and that he wished it “wasn’t the 21st century”….presumably meaning that once its out, they’ve lost all control and something nefarious could happen to the show (since the world is so dark and the internet is part of that?). I don’t get it, but it was interesting speaking with them – albeit briefly. My sense, from what I’ve pieced together from others who’ve spoken with him, is that Ira is perpetually torn between understanding people’s desire to record live shows, and his own discomfort with feeling like his every comment or bum note is going to live on forever. According to Jesse Jarnow’s book, Ira used to tape Dead shows back in the day — would love to hear his thoughts on that now. You’re welcome! Thanks for letting us know. MP3 link revived.